Marc Krusin is steadily making a name for himself as one of the most promising and exciting young designers in the industry. After graduating from Leeds Metropolitan University with a degree in furniture design, Krusin founded the Milan-based group Codice 31 with five other designers. Krusin is also the Design Manager at Piero Lissoni’s office where he is responsible for a client list that includes Alessi, Thonet, Flos, and Knoll. Additionally, Krusin has established his own firm Klay, and was honored in the Europe 40 under 40, an annual program that celebrates the best young European designers. In 2006 Knoll International introduced wa, a brilliantly simple office system designed by Marc Krusin and Piero Lissoni. wa’s defining feature, a patented 360 degree clip mechanism, allows any component to be attached to any workstation, on any side. There are no predetermined connection points. Marc Krusin collaborated with Knoll again to introduce the Krusin Guest Seating and Table Collection, elegant wooden designs with an industrialized craft aesthetic. 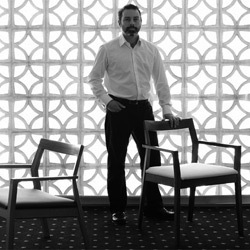 The chair design was awarded the 2011 GOOD DESIGN Award from the Chicago Athenaeum Museum of Architecture and Design. Krusin's latest introduction with Knoll is Anchor™, a portfolio of individual storage products that includes credenzas, doublewide pedestals and lockers.